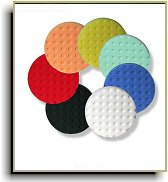 NEW High Performance CCS Foam Pads for Dual-Action Car Polishers! Our NEW high-performance CCS pads by Lake Country will make your dual-action polisher come alive... and your car shine! 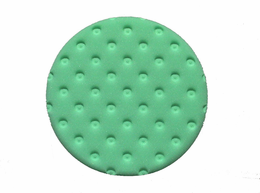 Conventional foam polishing pads absorb polish too quickly. This reduces polish and pad performance because most of the polish is trapped below the working surface of the pad. 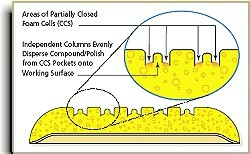 Lake Country's CCS Foam Technology solves this common problem by using strategic patterns of partially closed foam cells. Don't just take our word for it. Independent OEM tests confirm Lake Country's CCS pads out-perform convoluted pad designs. Now, for the first time, Lake Country's CCS Foam is available in a NEW line of High Performance Pads designed exclusively for Dual-Action Polishers (HP-DA). Our Lake Country HP-DA pads apply the premium CCS foam in a pad designed for the extreme demands of dual-action polishers. HP-DA pads have a beveled edge that offers more control when polishing at an angle. The pads also feature a back beveled Velcro platform that helps center the pad and provides extra flexibility and safety when polishing curved body panels and around trim. YELLOW: Use for heavy paint correction & cleaning! Use this pad for heavy paint correction and cleaning in place of traditional wool. ORANGE: Use for light paint correction! Use this pad for light paint correction in place of traditional wool. GREEN: Use to remove light swirls & holograms! Use this pad for light swirl removal or when removing holograms produced from heavier polishing. WHITE: Use to bring up full paint gloss! 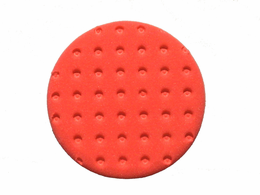 Use this pad for bringing up full gloss using a fine polish or pre-wax cleaner. BLACK: Works with all single-step cleaner/wax polishes! Use this pad with single-step products when only light polishing is required to remove fine swirls and bring up gloss. Also works well with fine swirl remover polishes. BLUE: Perfect for all one-step products & gloss enhancing polishes! Use this pad with single-step products when no swirls are present and with gloss enhancing finishing polishes. RED: Use to apply last step products! 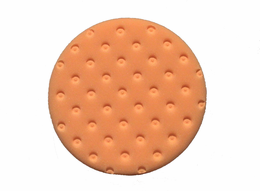 Use this pad to apply last step products, including paint sealants and glazes.